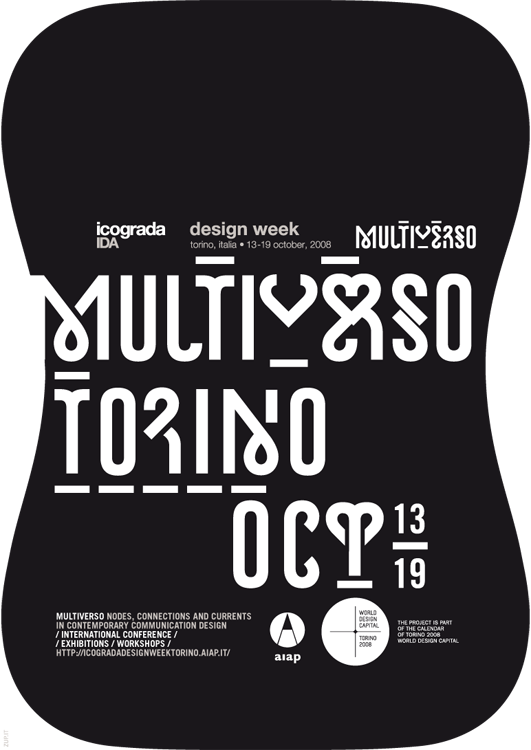 The Icograda Design Week Torino is held in a unique and internationally prestigious context; it is in fact included in the Torino 2008 World Design Capital agenda. Now in its first year, this biennial event will be hosted in the city of Turin, where international events devoted to every single design sector will be held across 2008. The city of Turin has been short-listed out of a number of famous world cities, based on its historical importance in the Italian design and manufacturing sector, for its excellent infrastructure and central geographical position. Turin hosts cultural organizations, museums, events of national and international interest, driving massive innovation over the past decade. This innovation process did not stop following the successful outcome of the Winter Olympics 2006. Icograda Design Week Torino is designed, managed and organized by Icograda – International Council of Graphic Design Associations and by Aiap – Italian Association of Visual Communication Design. This is a leading Italian and European event in terms of size and quality, it includes 3-day international conference, exhibitions, forums and several workshops for students. The speakers are major international authorities in different sectors of visual communication: branding, advertising, graphic design, web design, interactive design, type design, animation, illustrations, new media art. Along with these, the input of authors and experts from contiguous sectors will supply guidelines and perspectives for potential directions of development in design. The conference addresses an international audience of professionals, journalists, entrepreneurs, teachers, researchers, design and visual communication students, as well as architects, town planners, product and interior designers, and anyone interested in contemporary culture, design industry and in the way design and communication can affect it. Icograda Design Week is a world-class cultural and business event. It is your best method of gaining specific industry knowledge while networking with top design professionals, educators, students and executives from companies operating in the design field from around the globe. Our conference identify challenges and provide expertise for business leaders in the industry. This is why every year hundreds of communication design professionals attend Icograda design weeks and congresses. Your presence at a Icograda Design Week in Torino will put you and your organization in direct contact with senior-level executives in the communication design industry, providing opportunities for one-on-one networking and communication with the key influences and decision-makers.